And again we’re complaining. The weather hasn’t changed much since the last entry, maybe in the direction that it was and is even warmer than before. 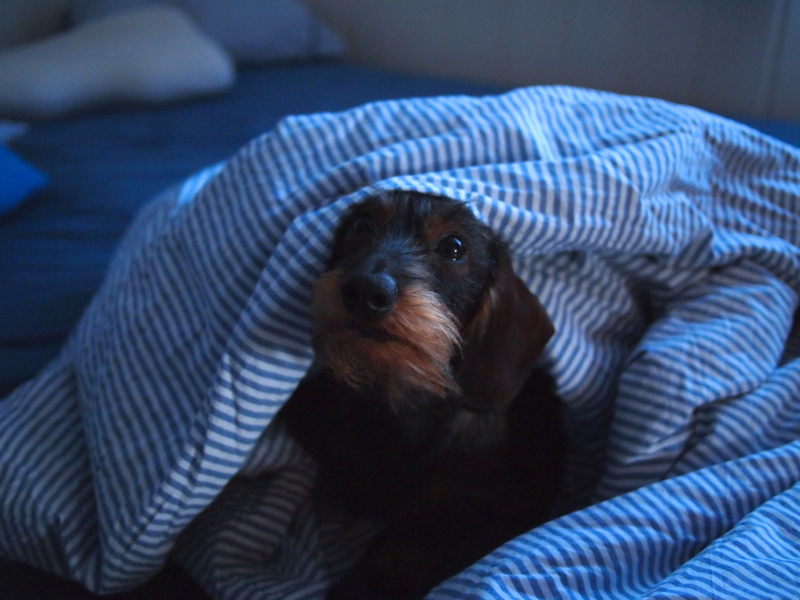 It’s so warm that we feel like sausages being fried when we enter our terrace or sleeping in an oven at night. What was our solution for the missing sleep due to the heat? -We camped in the living room and slept on our spare mattress. But let’s start somewhere last weekend. 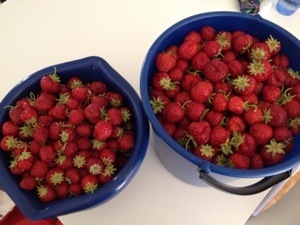 I went picking strawberries with our neighbor. After just 2 hours we had picked each about 8kg. Back at home I hung my feet in munchkin’s kiddie pool and started stemming them. It took a while and munchkin used the opportunity to eat as many as possible. 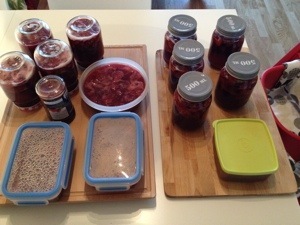 🙂 By the evening most of the berries were packed to be frozen and the rest were turned into dessert and jam, lots of jam. Pure strawberry jam and strawberry raspberry jam. On Sunday then I could feel that the scratching in my throat which I’d felt on Saturday hadn’t gone away. No, it had gotten worse and my muscles were sore. So while M went out to bike with a friend around a nearby lake I dragged myself, munchkin and Ecky to the fjord. 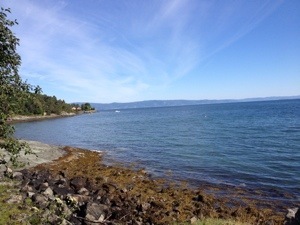 Maybe I should better say Ecky pulled us to the fjord. The weather was fantastic. Theo had a good nap in his stroller while Ecky jumped into the fjord to fetch sticks. He was such a happy little bugger. At the end of the day M and I were kind of at the end of our energy due to my summer cold and the heat so we camped in the living room. Munchkin explored the apartment before the tiredness caught him finally. We had only light, easy peasy dishes this week like potatoes with beans and eggs or Naan bread with Hummus or quesadillas. 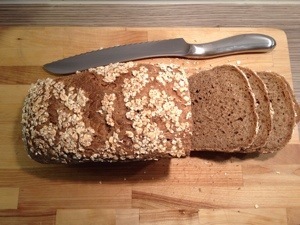 But I managed to try a new recipe for oat bread which is wonderful, a bit moist, very soft and has a fine flavor. Right now I’m waiting that the apricot pear crumble tart cools down that we can eat it with some vanilla ice cream. 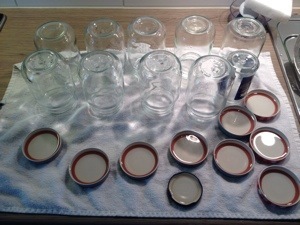 Mix all ingredients with your kitchen machine but preserve 400ml of water. Let the machine knead the dough on low-speed for about 4min. 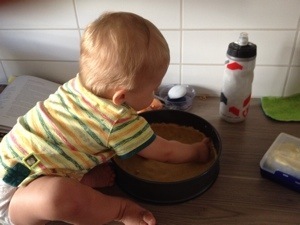 Increase the speed and add slowly more water and keep kneading. At the end (about 15min) the dough should be pretty soft but smooth. The rolled oats are going to absorb a lot of water. Cover the bowl with cling film and let it rest for about 1.5 hours. 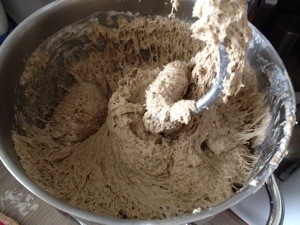 Split the dough into 4 even parts and let them rest on the counter for another 20-30min. 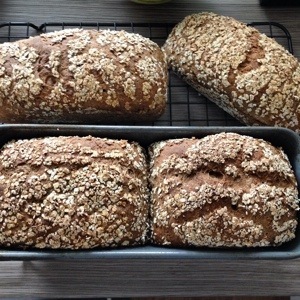 Then form each into a loaf, dip it shortly in water and roll it in the additional oats. Then set it either in a greased baking pan or on a baking tray with parchment paper. Do the same with the remaining loaves. Let them rest until they have reached double size. 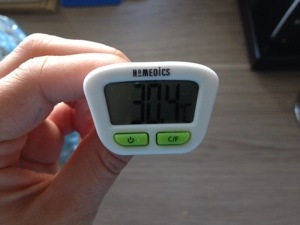 Preheat the oven to 220C. Bake the breads at the lowest position for about 45min until they are golden brown. Let them cool down on cooling rack. They are perfect for freezing or as a present or just to be eaten by yourself. When you have all those strawberries you have to do something else with them except making jam and freezing them. So I made a dessert which is not too heavy but so good. Whip the heavy cream with 1 tbsp of sugar and the ground vanilla until stiff. Set aside. Soak the gelatin leafs for 5min in cold water. 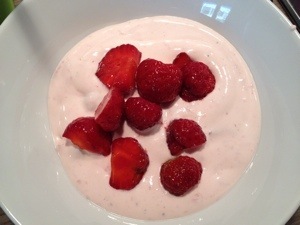 Take 100gr of the berries and 2 tbsp of sugar and mix them well. Pour them into a small sauce pan and warm them up under stirring every now and then. Take it from the heat and stir one gelatin leave well squeezed out after another into the warm sauce. Let it sit for a moment. Mix the fromage blanc with the sugar. Then take your strawberry sauce and mix 1 tbsp whipped cream into the warm sauce before you transfer all of it into the whipped cream. Fold the sauce well into the whipped cream, add the fromage blanc and finally fold the rest of your strawberries into the mixture. Cover the bowl with cling film and set it for 2-3 hours into the refrigerator. Enjoy! This weekend we might go for a bike ride and we’ll go to Sweden to pick up some dog food for our Ecky. I’m probably going picking berries again, but this time raspberries. 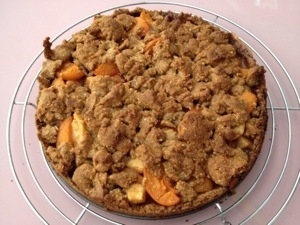 Hodiho, have a good week, we’ll dig into a nice piece of apricot pear crumble tart with vanilla ice cream now. If it’s good, we’ll post the recipe next week!